I am usually bone tired after a doing a demo, especially after the South Pasadena Arts crawl which is three hours long and goes until 9 p.m. Afterwards, I have to tear down, drive home, unpack everything from the car, wash up tools and tanks, and put everything back where it belongs in the studio. The last thing I do is put my papers under heavy boards to flatten. Then I hit the sack and sleep right on through to the next day! It's usually a few days later that I get around to really looking at the papers I made during the demo. I always think I do a "hack" job while demoing mostly because my full attention is not on the tank. And because takes me longer than normal to create a piece because I'm talking through the process and answering questions along the way, the bath starts to get very dusty and very cranky. I try to tell myself to be chill about it all...that people don't notice the dust spots and disintegrating paints and unclean lines the way I immediately do when I pull a paper from the bath. After all, I'm going for purpose here, not perfection. 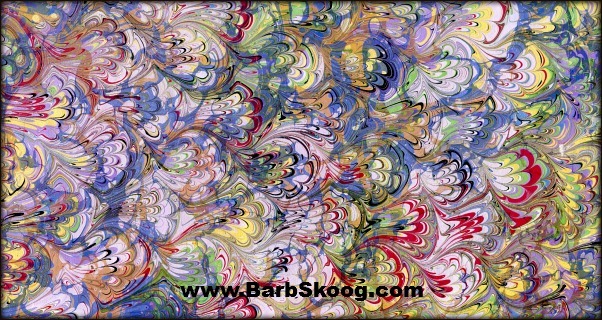 I'm simply trying to share the magic of marbling with others and raise awareness of the art form. Mission accomplished. When I eventually get around to looking at the demo papers a few days later, I am always pleasantly surprised by what I find. Sure, the flaws are still there but that's not what hits me first. What hits me first is exactly what people watching my demo see when a piece is pulled from the bath: pure, uncomplicated beauty and the joy of making it. And that trumps dust spots any day!